The diversion is in place following damage to the disused railway bridge following a road traffic collision. The car of a couple who stopped to help rescue some escaped sheep had their car window smashed and handbag - which included sentimental items - stolen. Were you driving past and saw something? Niton and Whitwell have some interesting and unusual figures on the streets as the parish holds its traditional best carved pumpkin competition. The annual snapshot of the health of the historic environment has been released today by Historic England. Find out what's been added and what's been saved. 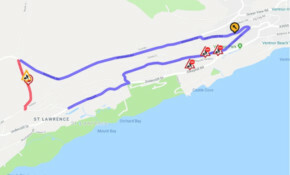 The work takes place overnight for four nights along the Whitwell Road, Ventnor in order to minimise inconvenience. The Leader has met with Southern Vectis and obtained an assurance they would now consult with town and parish councils. Southern Vectis say this is the first time in decades that a bus service for the rural communities they serve has been operated without local authority funding and that the current timetable for route 6 is run entirely on a commercial basis.